What made the experience of listening to Fatal Affair the most enjoyable? I loved the interaction between Nick & Sam. Marie does an excellent job of bringing the reader into their lives. 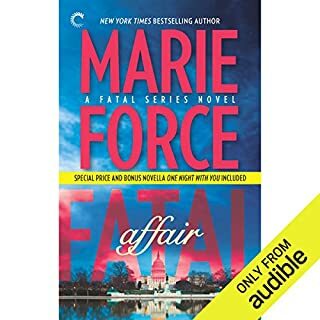 What other book might you compare Fatal Affair to and why? The book is a love story - mystery - crime novel all in one. I think my favorite part was the interactions between Nick & Sam. What did you love best about Shelf Life? I loved the Publicist and I loved Shelf Life. Kate is real - she had hopes, dreams, fears, and passion. 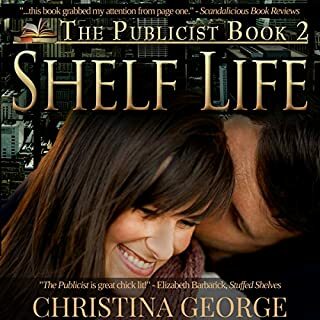 Shelf Life took me more into Kate's life - the struggles of working in the publishing industry - the fears of being in love and the hardships associated with it all. Christine does an excellent job of expressing the characters wants and needs. I found Lisa to be a excellent narrator. I love being read to and Lisa did an excellent job. My heart ached for Kate ~ her struggles,being betrayed, and her love. If you are looking for a love story that involves passion, betrayal and will power to succeed ~ you will love Shelf Life! I recommend listening to The Publicist first - then listen to The Shelf Life. Would you listen to Almost Perfect again? Why? Yes I will! Excellent story. The interaction of three friends - the past and the present. How so much can change. How finding love can be so hard and yet so rewarding. What does Jane Cramer bring to the story that you wouldn’t experience if you just read the book? The expressions and meaning in her words. She does an excellent job narrating. When I was small I loved being read to - I still love it. It made me want to read the whole series! Plus read every book Julie has written! Almost Perfect was the first book I read written by Julie Ortolon. I am hooked. I love how she writes and how she puts so much meaning into her characters. I listened to the Perfect Trilogy series - read the Texas Heat Series and now I am listening to the Pearl Island Series. I am telling everyone about her and how great her books are. What did you love best about Just Perfect? The feeling and emotions the characters had. Have you listened to any of Jane Cramer’s other performances before? How does this one compare? Yes I have listened to all three books in the Perfect Trilogy. She does an excellent job - her voice is clear and she expresses so much meaning in her words. I loved the fact that her thoughts about him were not quite true. So funny - that has happened to me a few times. Great series! In fact all of Julie's books I have read/listened are excellent! What made the experience of listening to Too Perfect the most enjoyable? Julie did an excellent job of making her characters real. This is book 3 in the Perfect series - I enjoyed all three books. What was one of the most memorable moments of Too Perfect? The dinner meetings they had. I loved the thought of that. Which character – as performed by Jane Cramer – was your favorite? Amy was my favorite - he feelings - desires - fears all seemed so real to me. The scene on the patio - the thought of that happening is so terrible - but real for some people. What did you love best about Falling for You? The emotions and feelings of the characters. Julie does an excellent job of making the characters real. People are complicated and it is so true how we see and feel differently about things that happen. This books was so real life to me - maybe because Chance and my hubby are very much alike. They have to think and then rethink about everything. I also liked how what we think is expected is not always what is best. Very good book! Chance - he reminds me so much of my husband. The way he processes thoughts and his actions. There were so many - I think the boat scene when Chance visited the boat with friends. I really liked the book - I love listening to stories. Being read to is one of my favorite activities. It was a great book for me - I love how Julie writes...I am on a mission to read/listen to all of her books. I have listened to the Perfect Trilogy and read the Texas Heat Series. This is the 1st in the Pearl Island series....not off to listen to Book 2 in the series Lead Me On. I really like buying the books with the Whispersync - letting me listen and read.Eva did an excellent job narrating the book. Her voice is very easy to listen too. As a publicist with a large, respected New York publishing house, Kate finds herself at the mercy of a broken publishing system, books that don’t sell, and author egos that are often, well, as big as the island of Manhattan. Enter the star editor, MacDermott Ellis: Tall, handsome, charismatic, married, and ready to save the day. Then there's Allan Lavigne, once a revered author - now as forgotten as last year's best sellers and his nephew Nick: Tall, gorgeous, sweet, single, and ready to sweep Kate off her feet. What made the experience of listening to The Publicist the most enjoyable? What other book might you compare The Publicist to and why? I really can not compare The Publicist to any other book I have read. This was my first experience listening to Lisa. She was a very good story teller. Her voice was easy to understand. I will be checking into other books she has narrated.